Gravenstein apples were likely brought to Nova Scotia by Charles Prescott around 1800. At his estate, Acacia Grove, he developed extensive gardens and took a keen interest in horticulture. He brought in many fruit trees or scions from other countries to see if they would grow well in the Nova Scotian climate and the Gravenstein thrived. It is said that by the time Prescott died in 1859, every Nova Scotia farm had at least one Gravenstein tree. The Nova Scotia Gravenstein is an early season favorite of just about everyone who tastes it. 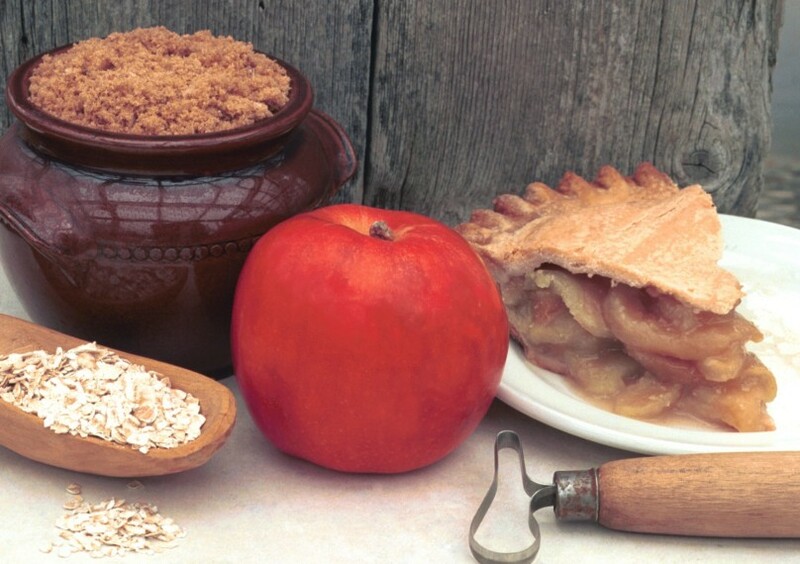 The Nova Scotia Gravenstein is the quintessential multi-purpose apple. It has a delightful flavor and is very juicy when eaten fresh; it is a wonderful cooking apple and also good for making cider. Gravenstein apples also store successfully for several months in cold storage. Gravensteins do not ripen all at the same time, which may be another reason for their popularity on small mixed farms of the past. Most Gravensteins, like the ones Charles Prescott popularized, have a delicate, waxy yellow-green skin with crimson spots and reddish lines. However, they can also be found with red skins. The oldest red Nova Scotia Gravenstein strains date to 1876, when a Gravenstein tree was found on the farm of Stanley Banks in Waterville, Kings Co. that bore fruit with red streaks. This was named ‘Banks Gravenstein.’ It grew in popularity with growers and consumers on account of its color. It has sometimes been referred to locally as the ‘Banks apple.’ In 1912 another red Gravenstein was found and named ‘Crimson Gravenstein.’ In Nova Scotia the green/yellow Gravensteins, which have been grown for nearly two centuries, are called Old-Fashioned Gravensteins to differentiate them from the two ‘newer’ red strains, the youngest of which is nearing the century mark. While Gravensteins used to be grown in most major apple growing regions of the world, they fell out of favour with the increase in global agriculture and now are severely threatened. In fact, during the first half of the 20th century, Gravensteins were the major variety of apples grown in northern California and were the source for apple sauce and dried apples for US soldiers in World War II. Today the majority of those commercial orchards, like those in Canada, have disappeared due to suburban development, wine production, and changes to the global apple industry. I live in Toronto, Ontario. Is it possible to purchase these apples and have them sent here? Thank you.